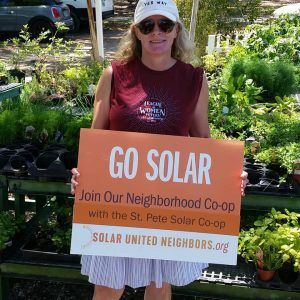 Solar co-op volunteer helps spread the word about the St. Pete Solar Co-op. 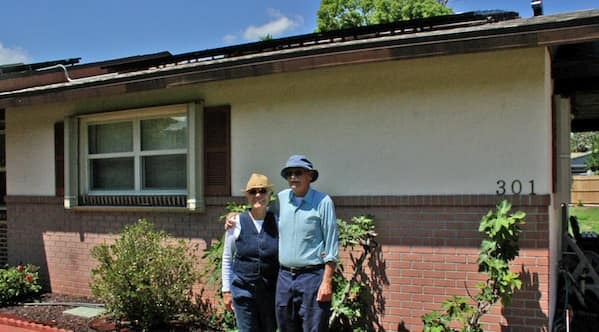 Neighbors in St. Pete have another opportunity to save money and make going solar easier through a third solar co-op. The group is seeking participants and will host an information meeting September 5 at 6 p.m. to educate the community about solar and the co-op process. Pinellas County residents interested in joining the co-op can sign up at the co-op web page: www.solarunitedneighbors.org/stpete. The solar co-op is free to join and joining the co-op is not a commitment to purchase panels. Once the group is large enough, Solar United Neighbors will help the co-op solicit competitive bids from area solar installers. Co-op participants will select a single company to complete all of the installations. They will then have the option to purchase panels individually based on the installer’s group rate. By going solar as a group and choosing a single installer, participants can save off the cost of going solar and have the guidance from the experts at Solar United Neighbors. The City of St. Petersburg, League of Women Voters of the St. Petersburg Area, Sierra Club Suncoast Group, Chart 411, Southern Alliance for Clean Energy, St. Petersburg Ecovillage, Pinellas County Urban League, and the University of South Florida, St. Petersburg are sponsoring the group.